Horizon Safety can provide all your access needs. From the smallest unit to large multi site access/ID solutions, we have it all. Our engineers can provide solutions to meet your needs. We can provide a fully integrated, networked system that allows control at the highest level. 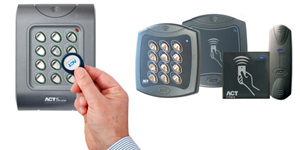 From single keypads with a code to access control solutions that are networked across a site with proximity cards or fobs, we will provide a solution that fits. Biometric solutions such as fingerprint readers offer even more security and particularly in high risk areas or in areas where specific security measures are needed, this offers a tailored solution. Linking access control solutions to car park barriers, door entry and turnstiles ensures the people inside your business are the people you ALLOW inside your building.